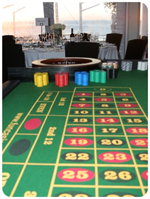 Roulette is the most famous & glamorous of the games and no gaming night will be complete without a Roulette table. Change your ‘Funny’ money at the Roulette table and your croupier will give you colour chips. Everyone will have different coloured chips. This helps you to quickly identify whether you are one of the winners. “Place your bets please” (If you have not already started placing your chips, start now). “Finish betting” (Get ready to stop placing your bets; you have around 5 seconds to finish betting). “No more bets, thank you” (You now stop placing bets & wait to see if you are a lucky winner). When the ball drops into the winning number it will be marked with a “dolly”. The croupier will then pay the winning bets.This game can accommodate +/- 10 players at any one time.